With Brady’s new DYO Custom Sign App, customers no longer have to wait to get a quote or a proof. In a matter of minutes, they can create custom safety signs and tailor messages to meet the needs of their workplace. Brady (NYSE:BRC), a global leader in industrial and safety printing systems and solutions, today announced its Design Your Own (DYO) Custom Sign App on BradyID.com. 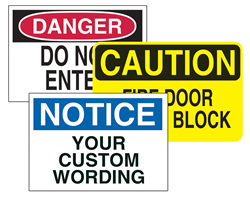 This new webpage allows users to quickly and easily create, price and order affordable, custom safety signs online. The DYO Custom Sign app walks users through a series of steps. These include: selecting a design option, determining size, header, color and industrial-strength materials (with a material guide for easier selection), editing and customizing text, adding graphics and images, entering quantity and then ordering.